Ron Reda waits to get cooking at Table Six in the Kemble Inn in Lenox. GREAT BARRINGTON — It’s 7 p.m. on a recent Thursday at Prairie Whale and restaurateur Mark Firth has already clocked at least a mile, escorting guests to tables, carrying drinks from the bar, and hustling in and out of the kitchen with full and finished plates of rustic, farm-fresh food. Although lots of New England restaurants claim to be seed to plate, Prairie Whale in Great Barrington is the real deal. Formerly called Bell & Anchor (the name changed in 2013 because of trademark issues), the restaurant opened in October 2012 and has been wowing diners ever since with dishes like grilled kale salad with cheese from Berkshire Blue; crispy brick chicken; and pork every which way from Firth’s own pigs raised on his Great Barrington farm. A veteran of the New York restaurant scene, Firth stepped away from his successful restaurant empire (three eateries and a butcher shop) and decamped to the Berkshires around 2010. “I was traveling to a lot of farms to source our ingredients and the more I got out of the city the more I wanted to move to the country,” says Firth. So he found a farm in Great Barrington, sold his restaurant shares to his partner, and started raising animals with his wife and two kids. The itch to own a Berkshires restaurant came a few years later when he came upon an old antiques store with a parking lot and an acre of land. With chestnut plank floors, a zinc bar, and cherrywood tables topped with glowing votives, Prairie Whale (another name for pig) feels like a casual tavern. Firth doesn’t take reservations and does not advertise. He doesn’t need to; those who know great food eventually find him, including many of his servers, his pastry chef, charcuterie expert, and executive chef, Stephen Browning, all of whom worked for Firth back in Brooklyn. “It’s really nice to be so close to the farms, and I visit them often,” says Browning, a Culinary Institute of America graduate, who changes the menu daily. This just-picked approach shines in a scrumptious string bean and shaved zucchini Caesar salad topped with grated Grana Padano and toasted breadcrumbs; a grilled Napa cabbage with roasted beets and buttermilk dressing; and fried green tomatoes with quinoa, goat cheese, and eggplant puree. A soft egg from Firth’s farm oozes its marigold-orange yolk into a pool of silky beurre blanc dotted with salmon roe and smoked salmon. Braised rabbit falling off the bone arrives with farro, olives, and garden tomatoes. The wine list is eclectic, yet affordable, and there’s a bottle for everything, including the seasonal fruit tart, which you must have for dessert. 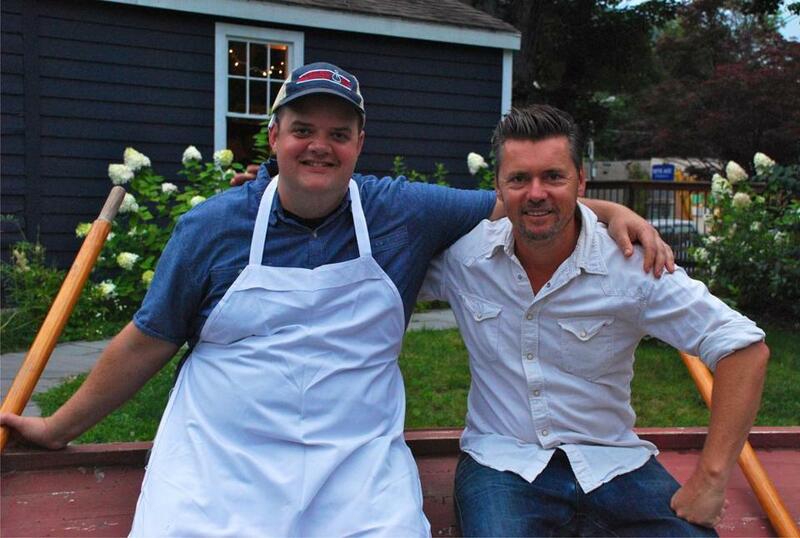 Prairie Whale Chef Stephen Browning and Owner, Mark Firth (on right). Over in Lenox, chef Ron Reda is also paying homage to the bounty of the Berkshires with his seasonal American cuisine at Table Six restaurant in the Kemble Inn. And, for those who’ve always wanted to dine at the White House, Table Six could almost qualify. From 1995 until 2000, Reda cooked for President Clinton and his executive staff. 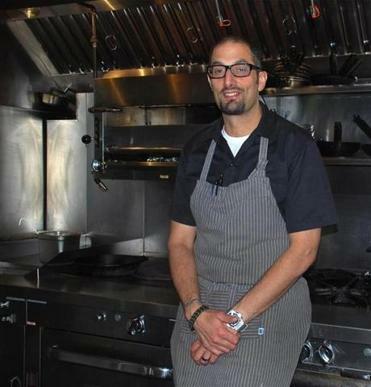 “At the White House, it was all about detail, consistency, and making everything from scratch, including all the breads and desserts, which is something I’ve brought here,” says Reda, who learned to cook from his Sicilian parents and then perfected his craft in the Navy. “Around 1992, I was working as a computer technician on a submarine and got really tired of the food,” says Reda, 46. “So on Italian night, I walked into the kitchen and offered to help.” Several platters of spaghetti and meatballs later, the captain requested Reda become a cook. When the job at the White House opened, Reda was told to apply. At Table Six, Reda peppers his menus with Berkshire’s best, including veggies, bacon, cheese, honey, and maple syrup. A recent dinner menu featured watermelon salad with watermelon radishes, a peppery arugula salad with tomatoes, shaved fennel, and Fontina, and Reda’s killer crab cake. Made with no fillers, just crab, it arrives crisp on the outside and almost creamy inside and garnished with lemon aioli and herbs from the inn’s garden. “People come back for that crab cake,” says Reda modestly, “that and the polenta,” another menu staple. Seasoned with sage from the garden, the polenta arrives hot from the oven crowned with truffled ricotta cheese, tomato sauce, and mushrooms. For mains, Reda always offers some sort of seafood, like pan-seared salmon with sauteed spinach and white bean puree. Soon he will be offering heartier fare, like braised veal cheeks and lamb shanks and dishes made with local hard squashes, kale, and cider. “Lots of people don’t know we’re open to the public and that we’re open all year round,” says Reda. And yet, among those who know good food, word is getting out. TABLE SIX Kemble Inn, 2 Kemble St., Lenox, 413-637-4113, www.tablesixlenox.com. Mon-Tue 8:30 a.m.-2 p.m., Wed-Sun 8:30 a.m.-8:30 p.m.